Why hello there…it’s just me, eight days late with my May Mix. I could make up some excuse but actually I’ve just been busy traveling and deciding what the last few songs should be. Basically, I’m a slacker. But I’m a slacker and it’s my birthday so as a gift to you, here it is (and as a gift to me, don’t gripe how late I am.) Also, I know that links to the other mixes seem to be broken; I’m having some problems with my archives on Typepad (where the site was hosted before) which I’m hoping to fix. In the meantime, though, I’ll repost them all in the next few days as I’ve gotten quite a few notes of concern. Fear not, the mixes exist. And will continue to, even in their Tumblry new goodness! Speaking of, let’s proceed with May. There’s some fancyawesomekickass new songs this month, not the least being Bon Iver’s eponymous new LP. Which is MAGNIFICENT, as is he, despite what he claims on the song Halocene. The Antlers’ new one is also stellar (I think I like it better than their first release) and I saw them live in NYC with my friend and HOLY MOTHER OF AWESOME, my brain exploded. I had seen them once opening for The National at Lollapalooza, and let’s just say that a drunken crowd + off day = the opposite of the greatness I just described above. They’ve redeemed themselves outstandingly. The title for this month’s mix comes from the new Raveonettes song of the same name, and frankly, I need to STOP forgetting that I’m young. 9pm bedtimes are quite possibly the reason why I remain unmarried. 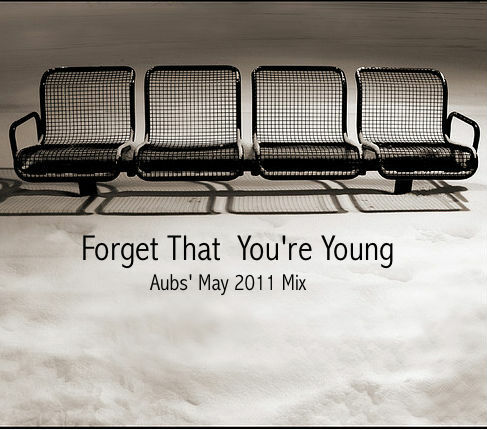 With that, here’s “Forget That You’re Young: Aubs’ May 2011 Mix”. Download & enjoy!